Shuttle buses transport you to Garapan, the island's primary commercial area from the pier. There are no facilities where you are docked. 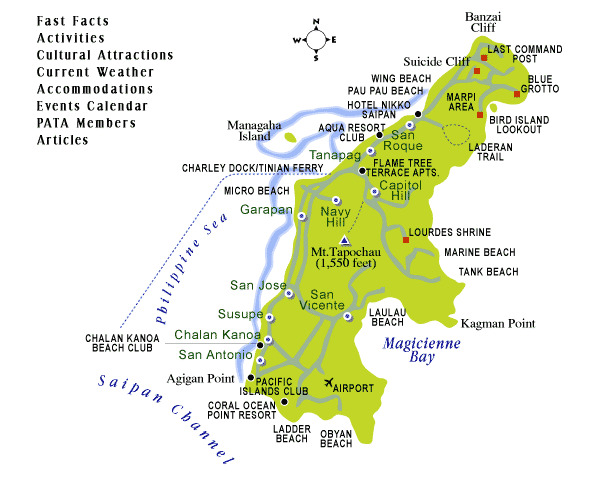 Saipan is 23 km (14 mi) long and 8 km (5 mi) wide. The best beaches and most populated areas are on the western and southern coasts, with the north and east being rugged and mountainous. Saipan is fairly small and by renting a car or moped, it is easy to drive around the island and take in the natural splendor, as well as visit a number of parks. Scuba diving is also popular, and the underwater world should definitely be seen. One of Saipan's most popular tourist attractions is a submarine ride in Tanapag Lagoon. The sub has been specially designed with large viewing ports for full access to the area's tropical fish and wartime wrecks. The most popular ship-sponsored excursion features a highlights tour of Saipan's wartime past with stops at Suicide Cliff, the Last Command Post, the Okinawa Peace Memorial and a run through Garapan. ATMs are available at most banks and major shopping centers.